Welcome to JB's on 41 Family Fun Center! We can thank our German heritage for our obsession with strikes and spares. Bowling has endured through many changes, but our commitment to fun remains. Lanes are oiled daily with tender, love, and care. Shoes are still rentals, and the sweet satisfaction of pins toppling and celebratory high-fives is timeless. 39,000 square feet of fun is found at JB’s on 41, featuring bowling, game room, volleyball, restaurant, and bar. JB’s on 41 has a colorful history, and we're always innovating. To continue learning about us, please interact with the tabs below to see how JB’s on 41 has transformed from a couple’s entrepreneurial dreams into Milwaukee’s premier party place. Our Vision: We are outstanding, fun people, helping families, having fun, and being better together. ​My passion is to help others, whether it be within my businesses or personal life. Knowing that I can make a positive difference in someone's life each and every day motivates me. It's what gets me up and going in the morning. JB's on 41 has become an extension of my personal beliefs and motivation. I believe that loving and caring families are what make communities strong. JB's on 41 provides a great, caring, and fun experience for our guests so that when they leave, they feel better for including us in their lives. Our guests will see a genuine, safe, and caring environment for them to really relax and enjoy themselves. Our staff is committed to ensuring our guests connect and have fun. We have a strong, caring, and helping culture, and we welcome you to our fun center! Before bowling centers, lanes are tucked into tavern and church basements. Wanting their own place to freely bowl, Deddo and Erv Raasch open the center in the 1950s, calling it Olympic Recreation, which is later shortened to Olympic Lanes. Brunswick supports the center’s development and still assists JB’s on 41 today. With 24 lanes, Olympic is one of the first centers in Milwaukee to feature automatic pinsetters. In 1975, Jerry Laczniak takes over as owner, adding lanes 25-36. 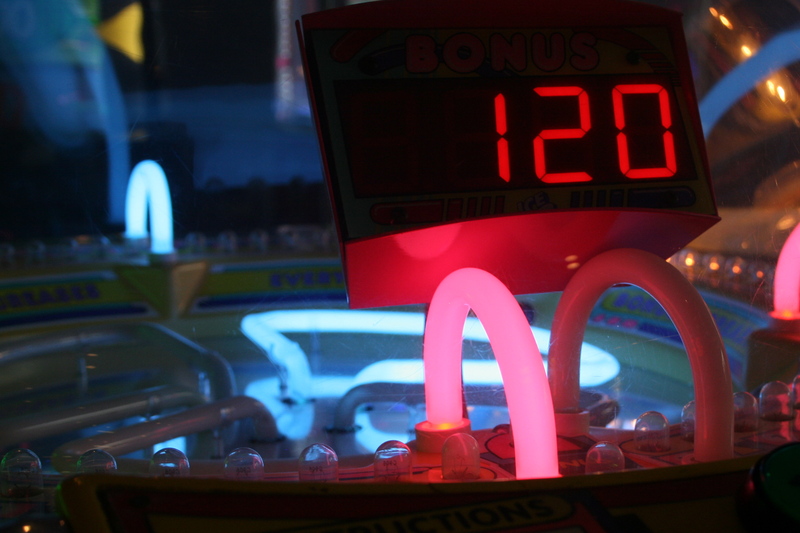 Jeff and Cindy Vitale run a tight ship for 20 years from 1982-2002, adding 5 sand volleyball courts and game room, where guests exchange quarters for rounds of pinball. Current proprietor David Bardon takes over in November 2002. He owns 3 other family fun centers in Wisconsin. In 2012, the center undergoes a massive renovation, transforming Olympic Lanes into JB’s on 41. During this process, lane 11 is lost in favor of a wall to create the Suite 41 lounge. With 10 custom cherry wood luxury lanes in Suite 41 and 25 traditional synthetic lanes, JB’s on 41 is the only hybrid center in Milwaukee. The JB in our name comes from owner David Bardon’s family, including wife Janell, children Jeremy, Jessica, and Joshua, and grandchildren Jared and Jenna. 41 comes from historic State Highway 41 that stretches from Upper Michigan to Miami, Florida. Guests in the 1950s dine in Olympic’s cocktail lounge. Drinks reflect Milwaukee’s local breweries, offering Pabst, Schlitz, and Miller, where many guests work. During the golden age of league bowling, breweries provide sponsorships to Brew City bowlers. Later, under Vitale, the Pacesetters Lounge is formed. Racing cars adorn each wall, foreshadowing the center’s future nominal connection to Highway 41. Pizzas and bar bites are staples, perfect for bowlers needing handheld items. Olympic hosts local entertainer Tom Green, talent shows, and date nights. Guests find their future spouses. 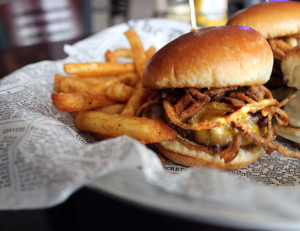 JB’s on 41 still offers entertainment options like karaoke and live bands. The restaurant is now called the Junction Bar & Grill in honor of the highway that connects the community. Upscale pub food reflects Milwaukee’s changing tastes while offering modern expressions of old favorites. Many ingredients are locally sourced, including dairy, sausage, and produce. This isn’t typical bar food, so all sauces and dips are housemade. Cheese curds are hand-battered and made with real Wisconsin cheese. Fresh bread arrives every day. Each meal is made with care. Suggested beer pairings match items with local and national brews. Craft beers, wines, and specialty cocktails are served daily. 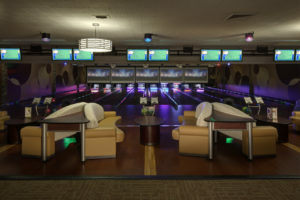 At the Junction, guests can dine and drink with or without bowling. Since the beginning, league bowlers flock to the center, along with athletes, politicians, and partygoers. In the 1980s, the oldest bowler to finish in a professional tournament is awarded at Olympic, Vicki Vukovich, age 69. Her straight shot earns her $605 and Sports Illustrated fame. Later, Olympic hosts multiple Intercollegiate Singles Championships. Left-handed pro bowler Rhino Page takes a turn at the center. Presidential candidate Mike Huckabee makes a stop, with CNN coverage. JB’s on 41 has become a community fixture by facilitating outings and financially contributing to many local organizations. Goodwill, Milwaukee Brewers, Boys and Girls Clubs, companies, churches, and schools have all experienced bowling at JB’s on 41. A new era of bowling has begun. Olympic is the first center in Milwaukee to take part in the national Kids Bowl Free program, providing kids with free bowling during the summer. JB’s on 41 still participates. Owner David Bardon helps create Bowling 2.0, a free 4-week curriculum that introduces people to bowling. Mission Reconnect and Weekly to Do List specials are added, promoting family time. Birthday parties and countless celebrations are held every day, often alongside league bowlers who remember the days of Olympic Lanes. Though the name of our family fun center has changed, our passion for all things bowling remains. Whether your score features more gutter balls or strikes, you play every week or stopped in for a party, or you prefer dining to bowling, all are welcome. JB’s on 41 is a place for people of all ages and abilities, and we’re glad you’re here. After all, fun is our business. "One of America's Coolest Bowling Alleys"
JB's is home to Milwaukee's "revamped galactic bowling palace." Explore the series here. One guest writes, "They have a very unique party area." Read all votes here. Check out these helpful links for info! Got a question? Call us at (414) 281-8200. Weekly to Do daily offers, rewards club, and many more bowling deals are all found here. We proudly offer open bowling every day of the year! Check out our open play hours and rates. We have traditional, social, short-season, custom, family, and youth programs. Join a league!